It is the late 80s and I have just discovered Yngwie through a “Best of 198x” collection released exclusively for the domestic [Greek] market. The catchy as Hell “You don’t remember, I’ll never forget” is ringing in my ears and I simply can’t get it out of my head! A few weeks later I have “Rising Force”, “Marching out” and “Trilogy” in my possession yet my hunger for this new genre which would later be named *Neoclassical Metal* is increasing. I can’t quite remember if it was a friend’s recommendation or a magazine review; all I know is I ended up with “Stand in line” in my hands. It was one of those really heavyweight vinyls, typical Music For Nations release – I still have it actually. 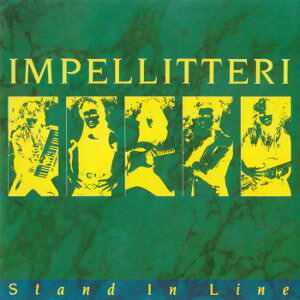 Chris Impellitteri was exactly what I was looking for. Funny thing, at that time I wasn’t aware of Bonnet’s collaboration with Malmsteen in Alcatrazz. Now, given I no longer play records -my pickup turntable remains unused for I don’t know how many years-, I felt it was about time to get this gem on CD. So, I spot this near-mint condition Japanese pressing on eBay at a reasonable price [$2 or $3 more than the non-imports] and close the deal. Want to know what happened? The very same day my order arrived, I stumbled upon a luxurious digipack reissue by Century Media featuring 4 extra tracks [the “Black EP”]. It would only cost €1~€1½ more, an added amount I’d be happy to give for such an edition. Excellent! Sounds like good ol’ Yngwie Malmsteen. I like it. ¡Gracias bro, excelente banda la andaba buscando!